This storyline about the Lizard was really good! I was particularly pleased that it was bouncing off of an old storyline in Spectacular Spider-Man #11 – 13, by Paul Jenkins and Daimon Scott. When the Brand New Day era started, they at first used Dr. Conners like the regular science assistant to Spider-Man’s adventures. It sort of side-stepped what happened in Spectacular Spider-Man, where it was unearthed that Doctor Conners can give into the Lizard as a way of escaping his responsibilities. Trying to keep his family together, and it being semi-public knowledge who was. All of that was revived and utilized for this arc! I’m looking forward to the upcoming arc, to tie to the Spider-Man movie. The Lizard is going to have a really good year! 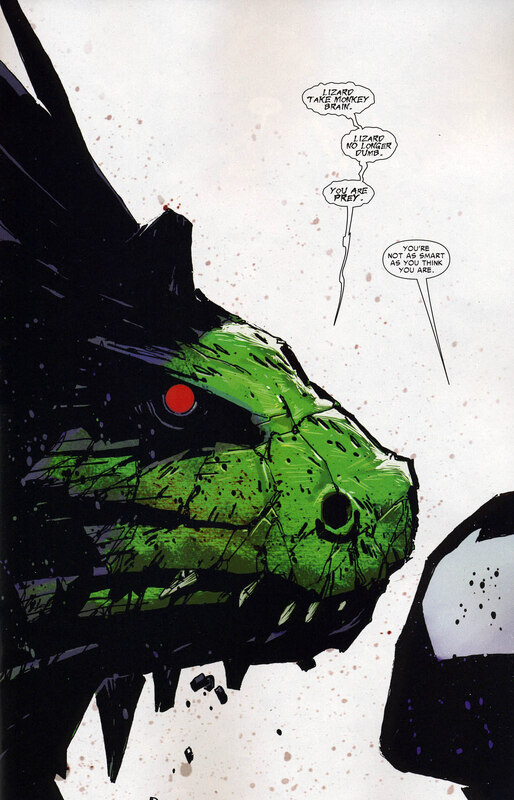 The Lizard’s one of our favorite villains, and we’re glad he’s going to get some screen time. Maybe he can ride that wave of publicity and finally take over the world with snakes and alligators. We’re glad you brought up the Jenkins stories because his time on the title is one of our favorite Spidey runs of all time. Just knowing someone else read and enjoyed it makes us happy!